1 inch Halloween themed button badge. 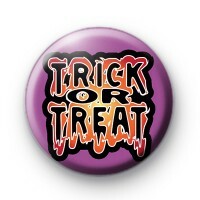 This purple pin badge has Trick or Treat written in a creepy font. We have a huge selection of Halloween badges in the shop. Everything from witches to pumpkins & lots of fun Halloween slogans too. Our Halloween badges make great alternatives to candy for Trick or Treaters!